Whether you work in the NHS or private sector surgeons are now undertaking ever-longer and more complex operations. No matter what your speciality, the work is demanding and stressful, but ultimately rewarding. In the UK scrubs may be more or less confined to theatre but that doesn’t make them less of an important part of surgeons’ workwear. Surgeons’ uniforms should of course be resistant to bacteria with minimal places for bacteria to hide. And they need to be able to withstand industrial laundering and be cost-effective to replace. With this mind we have designed superior surgeons’ Scrub suits. Our Unisex Medical Scrub Tops are made from a lightweight 67% polyester and 33% cotton fabric. The tops have 1 breast pocket and 2 hip pockets. A V-neck, short sleeves and side vents complete the look. They are available in a Regular fit in sizes XSmall to XXL large. 5 standard colours are available: Sailor Navy, Light Blue, Jade, Burgundy and Royal. A logo or name can be added. 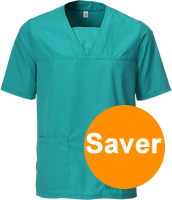 We also offer a Saver Pack of 12 Unisex Scrub Tops – Medical Scrubs. You can choose different colours and sizes at no extra cost. Co-ordinating Unisex Scrub Trousers have a draw corded elasticated waistband, 2 front patch pockets and 2 thigh pockets and are available in the same range of colours as the Scrub tops. Two fits are available: Regular (74cm) and Tall (79cm). Sizes again range from XSmall to XXLarge. We are also able to design and manufacture bespoke scrub designs. Perhaps you require different colours or have a specific design we can help create the custom surgeons’ uniform of your choice. Although you may prefer to wear your own clothes out of theatre, some doctors/surgeons still prefer to wear whitedoctors’ coats. Our Unisex Lab Coat in Howie / Lancer style fits the bill, with knitted cuffs and an internal pocket and offset front fastening designed to minimise the transfer of bacteria. It’s available in size 92cm to 140cm.